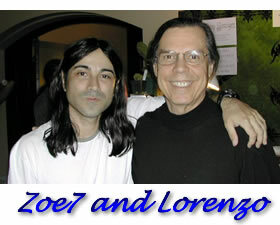 Zoe7 is a multi-dimensional synergy personality cluster who inhabits the body and mind of consciousness researcher, Joseph Marti. (The other five personalities are: Max McCullan, Ebhrious, Jiebro, Kzark Prestidius, and Lee Steel.) His book, Into The Void Exploring Consciousness, Hyperspace and Beyond Using Brain Technology, Psychedelics and Altered-Mind States, depicts Marti’s experiments with mind machines, entheogens, and psychological time travel, how the Zoe7 cluster came to be, as well as new theories on parallel universes and probable Earths, the mechanics of reality and existence, and the mind of God. Hello Lorenzo, This is Alleen Marti, Im Zoe sister, I wanted to let you know we lost my brother July 15th, 2013 in Brazil. I still can’t believe it he had some many new projects. His 3rd book still not yet finish… We will be doing a memorial in Brazil at Spirit Vine, hope one day you can visit and see all the other stuff he was working on.